Welcome to our gallery of stylish home bar ideas. A home bar is a great place to mix up your favorite cocktails to relax and socialize. In this design gallery we share pictures to inspire, and provide ideas for setting up your own home bar. The home bar shown in the image above is stylish and simple, using elegant materials to create this gorgeous home bar. The large doors/windows helps make the area look bright, while the all-white surfaces of the house makes the warm walnut laminates of the bar stand-out. The bar counter at the back has no overhead shelves, but instead adds an accent wall with brown/beige mosaic tiles which goes from the counter height up to the ceiling. A functional and efficient home bar must include all the essentials when it comes to its design. Building a home bar can be divided into two phases: setting up and stocking up. The “setting up” part includes the design, layout and construction part, while the “stocking up” part includes the moving in of bar accessories and the beverage stocks. Storage Cabinets – Storage cabinets are essential not only for storing beer, wine and other bottled drinks, but also for keeping utensils, glassware and other bar accessories. It is ideal to have a separate and specific place for each because aside from having different storage requirements, it also allows you to easily look for what you need. When designing your home bar, include plenty of storage so that it looks less cluttered. Combine different types of storage units such as shelves, drawers, pullouts to obtain optimum storage capacity. Also keep in mind that your storage cabinets must always be dry. When storing liquor it should be kept out of direct sunlight and in a cool place. You can read more about home bar cabinets as we go on with this article. Bar Counter – A home bar typically consists of a work counter and a bar counter. The work counter is typically the same height as any standard kitchen counter and is used for food and beverage preparation, while the bar counter is usually raised at a higher level, functioning as a serving surface for drinks and for casual dining. There are several factors to consider when choosing a bar counter for your home bar namely the material, the design of your space and your budget. The key guideline to keep in mind for home bar counters is to choose a countertop material that won’t scratch and is impervious to liquids and stains. You can learn more about different bar countertop materials, an overview of their pros and cons and some useful tips as we go on with this article. Bar Stools – One of the main features of a home bar is a seating area. Bar counters are often furnished with at least two to four chairs to allow for personal use, for bonding with the family or for entertaining friends. Bar stools are higher than regular dining chairs and provide a comfortable seating area that is proportional to the tall height of a bar counter. When choosing a bar stool for your home bar, the most significant factor to consider is the height. The correct height is critical, because if your bar stool is too short, it will be hard to reach the bar, but if it’s too high, then you’ll have to slouch. Not only does a bar stool provide comfort, but it also helps in keeping your seating furniture well balanced and proportional to the height of your bar counter. Bar stools have an average height of 30 inches, but typically it can range from 30 to 36 inches from the ground and is perfect for counters or bars that are 40 to 46 inches in height. To know the right bar stool height for your home bar, measure the height of your bar counter from the finished floor line upwards, then subtract 10 inches. The resulting approximate stool height will provide enough room for your legs and will give you enough space to move freely and comfortably. The number of stools that will comfortably fit in your home bar counter will depend on the total length of your counter. If building a new home bar, this wouldn’t be a problem because you can customize and adjust the counter’s length according to the number of bar stools you want. However, if you are dealing with an existing counter, then you can take a reverse approach by dividing the total length of the counter by 24 inches or 2 feet. For example, if you have an existing home bar counter that is 6 feet in length, then that means you can comfortably accommodate 3 bar stools. This provides adequate space to get in and out of the seats comfortably or to eat and drink without bumping into the next person. Bar stools are available in different materials. Some have cushioned and upholstered seats while others are made up of wood, metal, woven materials or fiberglass. The design of your bar stool will depend greatly on the overall look and style you want to achieve. Also, keep in mind that each type of material has their own positive and negative features, so do a little research before choosing to ensure that you get the best quality that can last for years. In addition to appropriate measurements and the right height, when choosing a bar stool for your home bar, also take into consideration other factors such as comfort, functionality and the overall decor of your home. A simple bar counter set-up in the corner which features gorgeous Oak cabinets and display cabinets, combined with built-in wine fridge and stainless-steel fridge. It also has a gorgeous Himalayan White countertop and oil-rubbed bronze fixtures for the lavatory. Bar Decor and Special Features – Accessories and other special features are also considered as home bar essentials because they help you complete the overall look of the space. How you design your bar can provide the ambiance and feel you want and your decor will help set the tone for at home entertaining. Essentially, the decor of your bar area must blend with the rest of the home. Bar decor ranges from a simple candlelight glow to a surround sound flat screen TV heaven. You can include hanging glass racks for that extra flair or some framed wall arts and other decorations. Home bar decors also depend on your personal taste in style and preference. So get creative and explore. Lighting – A home bar needs general lighting, task lighting and accent lighting. General lighting, also known as ambient lighting, pertains to a main lighting source that is intended for illuminating a whole space. Ambient or general lighting for home bars must promote an adequate amount of brightness and an equal distribution of light. For home bars, general lighting is usually fixed onto the ceiling and is often surface mounted. It can also be a drop light or pendant light or a series of down lights. Use daylight bulbs for ambient lighting in home bars to get a bright general illumination. Additionally, make sure that your ambient lights do not have any glare. Task lighting or localized lighting are additional lighting fixtures which are used to aid users in accomplishing activities. It is usually added to spaces where the main ambient light source does not suffice. 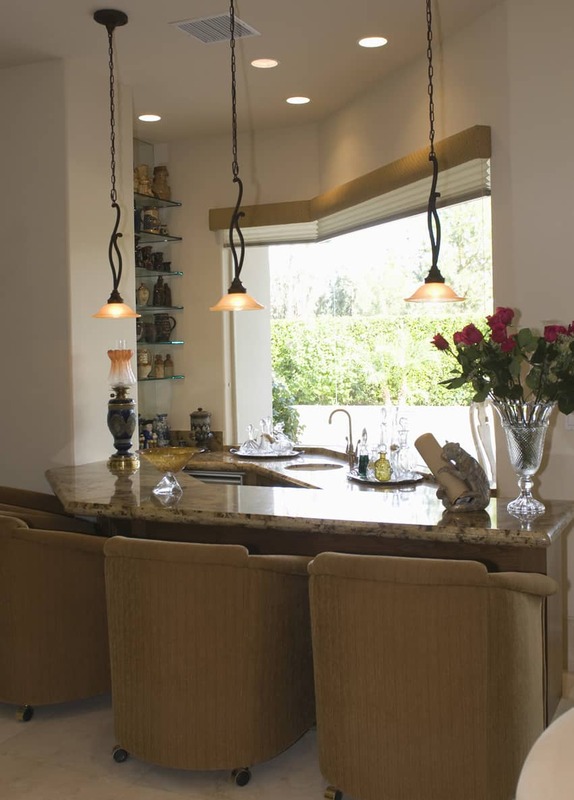 Some examples of task lighting for home bars are under cabinet lights. 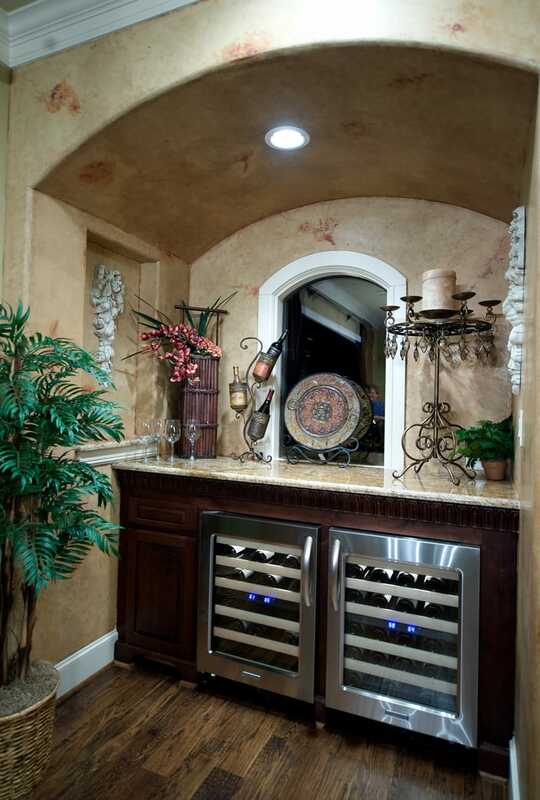 Under cabinets lights are useful in home bars because they assist you in looking for what you need quicker. With such, you can also clearly see your glassware and other accessories. Accent lighting is used for adding drama or for creating a mood in a space. It is also used to highlight or accentuate a particular area or part of a space. Accent lighting also aids in generating a cozy and relaxing atmosphere. 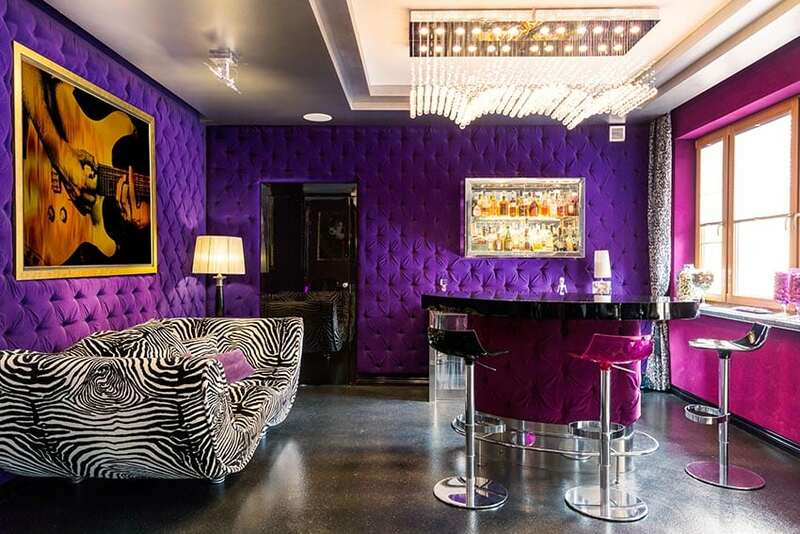 It is essential for home bars especially if you want to enhance the ambiance or create visual interest. Accent lights are usually in warm white or yellowish color. 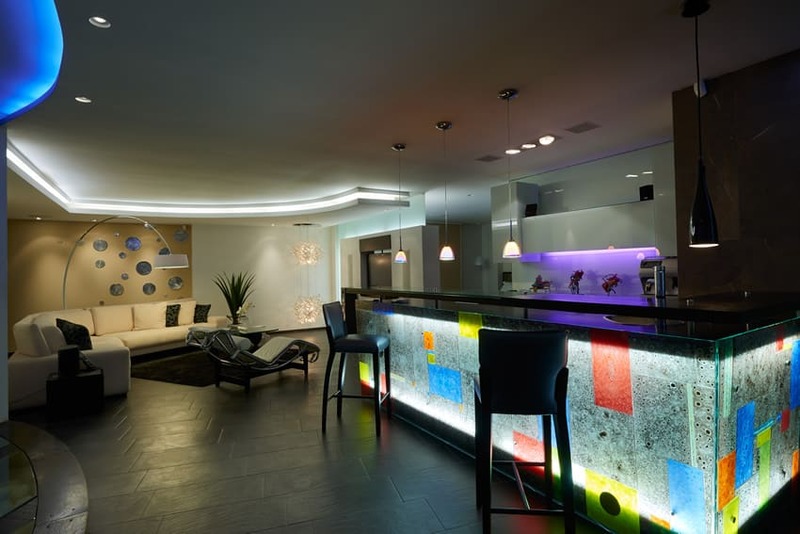 Examples of accent lights which can be used for home bars are wall sconces, recessed lights, floodlights or torchere. Appliances – Home bars usually include appliances such as a small refrigerators and wine chillers for cold storage. If the space allows, you can also include a blender, coffee maker, dishwasher, stove for preparing snacks and even a full sized refrigerator. Appliances for recreation such as a TV may also be included for added entertainment. For those with limited spaces, home bar appliances are available in a variety of sizes which can compactly fit even in small layouts. Wine coolers, for example, have different capacities which can hold a number of bottles. Some can hold up to 38 bottles and include two different temperature zones. Bar refrigerators typically have a specification of 20 inches height by 17 inches width and 18.50 inches depth and have a capacity of 50 liters. Compact appliances can be incorporated into the base of cabinetry. Sink and Running Water – Some home bars include a sink for quick clean up and easy preparation work. A wet bar is a great option if you want to quickly wash your glassware without the need to carry it back to the kitchen. If you plan on setting up a wet bar for your home, make sure that the area is close to a water supply and have the plumbing checked by a professional. Power/Electricity – Power/electricity are also some home bar essentials because you obviously need it to make appliances work. There should be an easy access to electrical supply in your home bar. Make sure that the area has sufficient convenience outlets for small appliances like a blender or a coffee maker and special outlets for a refrigerator and wine cooler. Free standing Bar or Mini Bar – This is actually not a bar essential, but it is one of the options you can explore if you have limited space in your home but still want a place for drinks. Freestanding home bars are readily available and offer convenience and portability. For those looking to take the fun of a home bar outdoors a mobile bar can fit that need. Aside from free standing bars, a good way to design a home bar is to conceal it by containing it within a built in media wall. A simple tall cabinet can be furnished with a bar fridge, an appliance garage and some glass storage. Finish it off with some doors which can be easily closed or opened. In that way, you home bar can be hidden away when not in use. Tucked in a little corner of the house, this bar area provides a good little get-away place to relax and drink wine. It has walnut-stained counters with matching overhead display shelves featuring an array of wines and other liquor bottles. After setting up your home bar using the design essentials, it is now time to stock up on your bar accessories. Bar accessories are the basic items and equipment that you need to store in your home bar to keep it running. These are the items you need in preparing drinks and other stuff. Here are some examples of bar accessories for the home. Glassware – A variety of glassware on hand is recommended to meet all of your bar needs. Typically you will need to stock a type of short glass, tall glass, and a stem to meet the demands of most occasions. For everyday use, at least six to eight pieces of each type can be a good start. However, if you love hosting parties and invite a lot of people on your home, invest in eight to 12 pieces of glasses. Some other glassware which can be handy for a home bar are tumblers, high balls, beer glasses, mugs, shot glasses and a pitcher. Barware and Bartending Equipment – Mixing up your favorite drink will require a few of the proper utensils and some basic equipment. Well stocked home bars have spoons, shakers, ice cube trays, ice bags, strainers, jiggers, cocktail shakers, muddler, measuring tools, knives (for juicing), lemon zesters, corkscrews and wine openers in easy reach. Alcohol – Stock up on essential liquors and a few basics for your home bar. For many a well-stocked beer fridge and wine cellar could do the trick for a home bar getaway. However, there are a few alcohol selections that can be added to your home bar. These include Gin, Tequila, Rum, Vodka, Cognac, Bourbon and Whiskey. Also to make classic cocktails, you can stock on base spirits and a few mixers. Many drinks require a mixer and some of the popular choices include club soda, tonic, ginger ale, and cola. Alternatively, you can also include non-alcoholic drinks in your stock so that you have a wider variety of choices. Your home bar needs to have enough cabinet storage to keep your bar functional and clutter free. An effective home bar combines different types of storage units like a base cabinet, an overhead cabinet, open shelves, drawers and pullouts to achieve optimum storage capacity. Clever storage solutions like a pullout shelf also allows you to maximize every inch of space that is available. You can also include organizers and metal wire baskets inside your cabinet systems to keep bar accessories properly sorted. Often bar cabinets have some glass doors so you can showcase your glassware. Alternatively, hanging wine glass racks can also be used if you want to display your stemware and access them easily. Those who wish to keep the home bar tucked away out of sight, may want to select a cabinet with a hidden bar area to keep it discreet. If you’re wine drinker you may want to select cabinetry that has an area deep enough to accommodate wine bottles on their sides. Pullouts and slotted cabinets with individual compartments also work well in holding liquor bottles that don’t require refrigeration. A small pantry can also come in handy for storing dry ingredients or snack items for your home bar. If your budget permits, do opt for custom cabinetry. Custom cabinetry allows for modification based on your specific needs and requirements. Everything is precisely measured and accounted for. Also a custom made home bar cabinet system is designed to maximize space while still allowing for some display areas to show off attractive glassware and special accessories. However, if you have a limited budget, do not be afraid to explore other options for storage and cabinetry. You can use prefab cabinets or get creative by repurposing old furniture such as dressers, armoires or bar carts. This home bar keeps it simple with one long counter in solid Pine wood to match the engineered pine floors and overhead cabinets with frosted glass of the same finish. It uses salt & pepper granite countertop with multi-color glass mosaic tile backsplash, and a cocktail table with 2 barstools to complete the mini bar. A home wet bar is setup with a sink and running water for serving drinks and becomes a central hub for entertaining. Whether you want a place to hangout with an alcoholic cocktail after work or want a place to socialize, this spot in the house offers an enjoyable atmosphere to relax. A wet bar is a great place for family and friends to try and taste refreshing drinks and different varieties of cocktails. A wet bar is also efficient when it comes to clean up. Since there is a sink within reach, glassware can be washed immediately. Prep work is also more efficient because you are close to a water supply and can make snacks with ease or put water into drinks without the need to go back and forth your main kitchen. 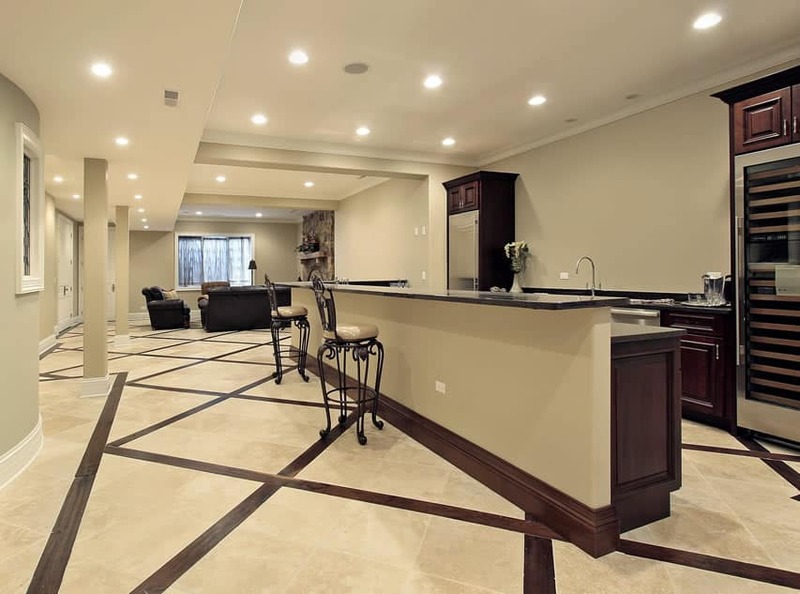 Typical location for a wet bar is the basement. Wet bars are easy to build and can be undertaken as a “do it yourself” project. On the average, installing a new wet bar can cost $1400 per project. Determine the location – Measure out exactly how much space you will be using for the home bar including how many seats you’ll need to accommodate guests. Popular areas for a home bar are in a dining room, space room, or living room. 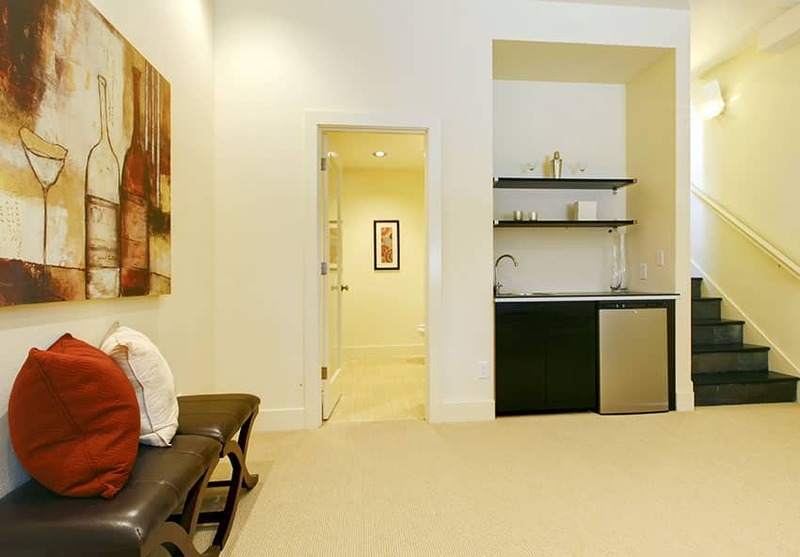 The basement area is a common choice as its a spot that is away from high traffic area of the home. Big spaces can utilize wall-hung cabinets for glassware and space for a refrigerator or dishwasher. 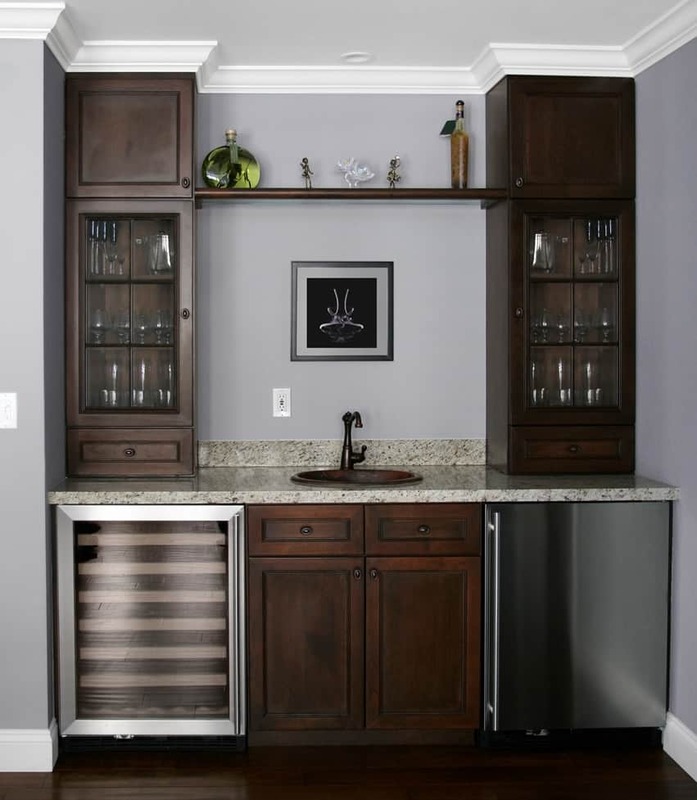 Cabinets can also be used for storage of mixers, wines, and liquor bottles. Plumbing – A wet bar will need a plumbing for efficient operation. Sinks can be installed directly in an island for ease of cleanup. For designs where seating is not desired, a custom single wall wet bar with cabinets of glassware can be combined with an under mount sink. Tile backsplash – An attractive tile backsplash will add some excitement to the design and let you add your own personal touch. Wet bar cabinets – Built-in cabinets is a necessity for storing glassware, alcohol, mixers and other essentials. Bar cabinets with glass doors are ideal for showcasing liquor, drink wares, and bar accessories. Other storage ideas that can be used are a portable buffet table or bookshelf. Home wet bar island – An island can provide extra space for preparing drinks and shaking and stirring. With the island, additional barstools can be provided for a true home bar experience. Consider appliances – A small refrigerator with a freezer can provide you with ice to keep beverages cool. A dishwasher can make clean up easier after your done. This bar area placed on one end of room is the perfect spot for the bar as it is placed directly adjacent to the pool table. 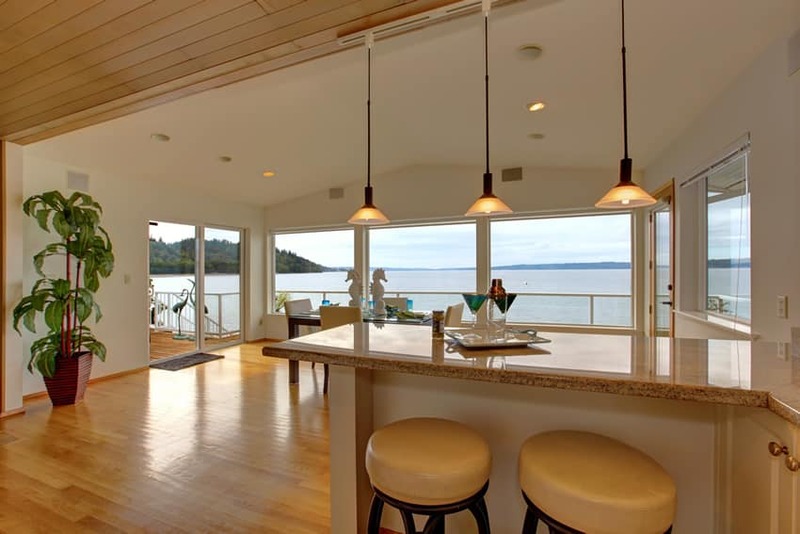 It has Golden maple wood floors which helps highlight the red mahogany-laminated cabinetry. The counter top uses green granite, and a wine rack is placed on the corner area of the counters. In an attempt to maximize the unusual corners of the house, this small bar area was built to make use of the space. Despite its awkward location, the large window illuminates the space well, helping it appear more spacious. The counters are built-in with oak laminate finish and beige solid granite countertops, glass display shelf on one wall and upholstered barrel seats for the snack/drink bar. There are many ways to make use of the space under the stairs, and turning it into a glamorous mini bar is one of the most perfect ideas to use it for. A narrow snack counter clad with marble stone and onyx front with backlights is placed parallel to a small L-shaped built-in counter with brown solid-surface and a small sink area. 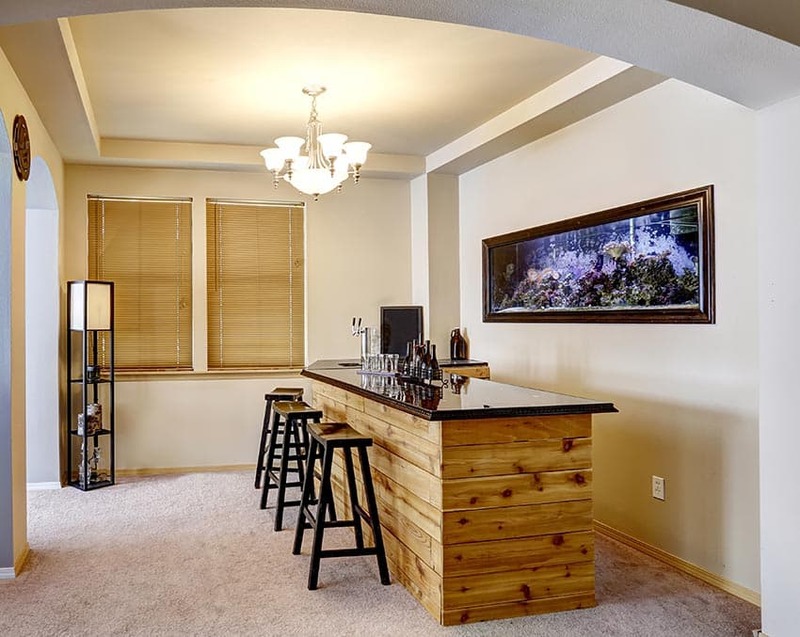 This small home bar right inside the home office to help you relax and relieve stress. It has red mahogany-laminated cabinets with built-in wine fridge and white display shelves with mirror. A small sink is built in to the cabinet to help with prep and clean-up. A rustic home bar can take you back to an earlier time and create a relaxing ambiance you and your quests will love. Some of the ways to implement rustic charm in your home bar is through decorative cabinetry with elaborate scroll work, rich stone flooring and accent walls, and natural wood and stone countertops. A rustic theme in interior design generally puts an emphasis on natural finishes like wood, natural stone and reclaimed lumber. Colors and textures play a big part in creating a rustic feel with neutral colors such as beige’s and browns. The theme makes use of handcrafted and often features distressed items which are finished in a natural colors and other earthy shades. Some other characteristics of rustic themed interior are timeworn, homespun and vintage. A rustic home bar can take you back to an earlier time and create a relaxing ambiance you and your quests will love. It evokes natural coziness and a warm and inviting feel. To achieve this look, use wood as the most dominant finish in your home bar. Wood cabinetry, whether in natural finish or in rich stains contributes a classic country flair to a home bar. Decorative cabinetry with elaborate scroll work and paneling are also prominent features in rustic inspired home bars. Some other ways to implement rustic charm in your home bar is through rich stone flooring, countertops and accent walls. Combing natural stone with wood adds contrast and contributes depth and dimension to your home bar. Some natural stones which can be used as accents in rustic home bars are limestone, slate, granite and marble. It can be left unpolished and raw for that unfinished and aged feel. As mentioned, colors and textures play a big part in creating a rustic feel. Contrary to a modern inspired home bar which sticks with sleek and smooth surfaces, a rustic inspired home bar encourages a play on textures. It also has a neutral color palette, but can sometimes introduce accent colors which are deep and rich. 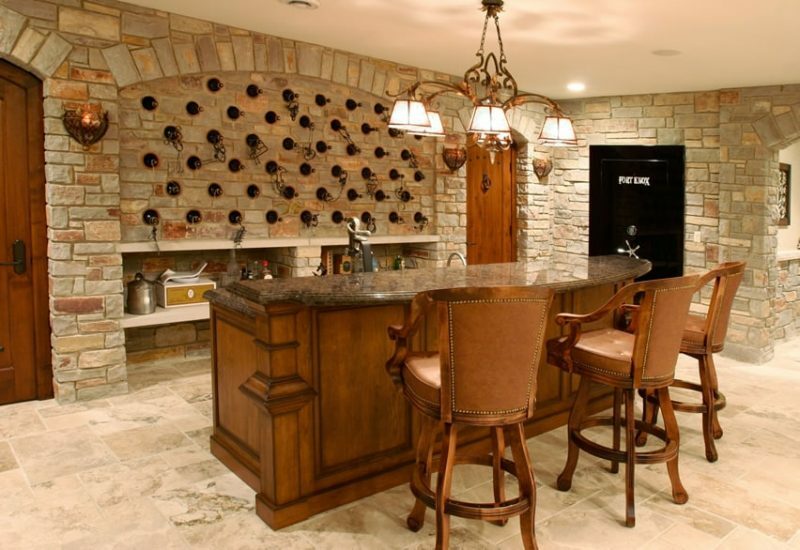 Going for the rustic look, this basement home bar tries to emulate a wine cellar. 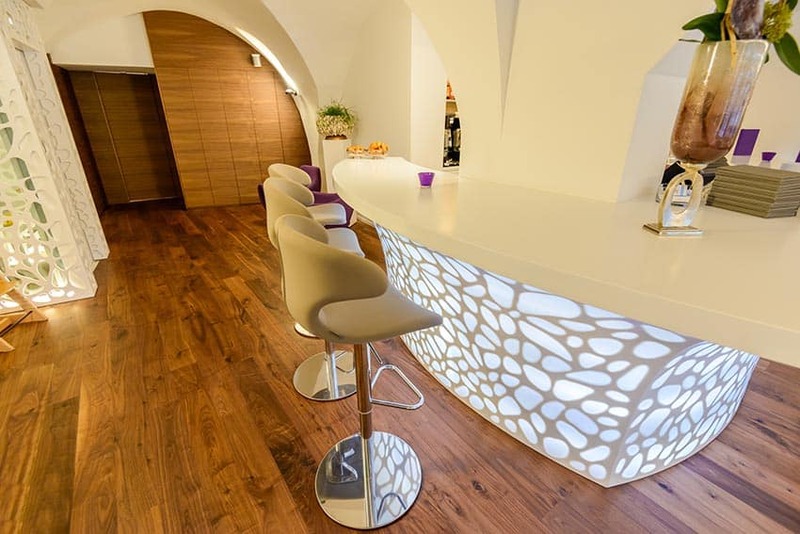 Using natural stone tiles for the floor and masonry tiles for the walls, it creates an old-style appeal to the space and even integrates the wine storage through holes on the main bar wall. The main bar counter is constructed out of solid Maple with brown granite counters and matching upholstered wooden barstools. The unique gothic arc ceiling with terracotta bricks gives the space a unique aura – rustic and elegant at the same time. The long bar counter is also finished with bricks and has a countertop with a unique curvy shape. Even the walls of the main bar area uses brick finish, and even uses antique oil-rubbed bronze light fixtures to complete the look. A classic country inspired home bar which uses an excellent combination of materials. It uses wood-look tiles for the floors and beautiful solid walnut cabinets to go with the dark gray granite countertops. The wall is finished with terracotta bricks to give it a classic appeal and has a matching set of barstools to finish the look. This home bar is a dream for every wine-lover. It features floor-to-ceiling height wine racks which occupies the whole room, with a little bar counter when you need to serve wine and a small table for two. This is a great home bar idea especially for those who want a home bar but has limited space. It is only around one and a half meters long and integrates two wine fridges into the cabinet. The counter has beige granite countertop and also serves as a display area for wine and other home accessories. One great way to take you home bar into a whole new level is to upgrade it into a game room bar. A game room bar combines the features of a bar, which is mainly used for socializing and drinking, and a game room, which main purpose is for recreation, fun and entertainment. For this type of design, a wet bar or dry bar can be used, depending on the homeowner’s needs and preferences. Typically, game rooms are also combined with a home theater or entertainment system. They are often equipped with a pool table, ping pong table, shuffleboard, surround sound stereo system and a large television. If combined with a home theater system, a gaming console also fits in with the design. Unlike other standard home bars which are compact in size, a game room bar requires a larger space. It can occupy one spacious room or in some cases even a whole basement or an attic. To effectively make use of space, proper planning and creative design is needed. Your layout must be carefully thought of, otherwise your game room bar will look too cramped up. It is also wise to take note of important measurements when designing a game room bar. Sports and gaming equipment can be quite bulky so they have to be accurately measured and laid out into the available space. 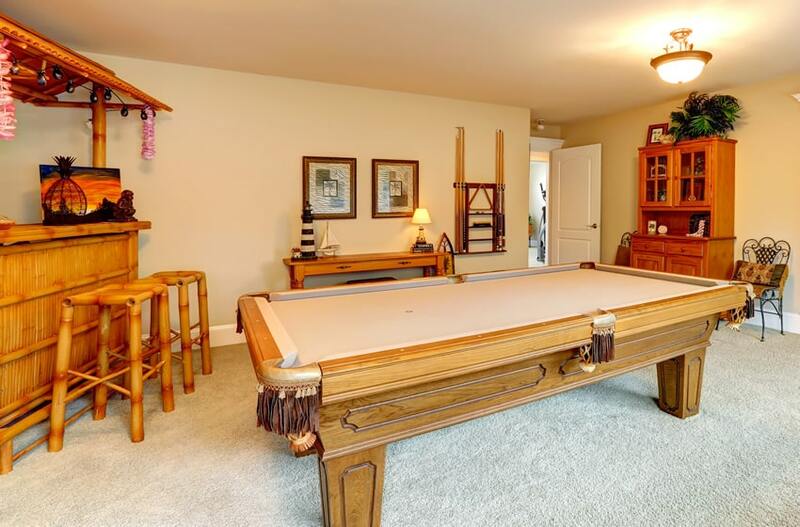 Pool tables, for example, comes in several standard sizes which range from 7 to 9 feet. A standard 8 foot pool table had a dimension of 44 inches by 88 inches, while the pool cues are about 57 inches in length. Pool cues should also be taken into consideration, otherwise, the player can’t move freely within the space. If your space doesn’t allow for suc, you can always go with smaller options like air hockey tables, foosball tables or arcade games. Alternatively, a game table can also be included in your design to provide for a flexible gaming area for card games and other activities. Other game room bar furniture include gaming chairs, spectator chairs, lazy boy recliners or bean bags. Accessories can include small basketball hoops and other gaming console equipment. When it comes to game room bar decors, it is an excellent spot to display colorful artwork, collections and memorabilia from your favorite sports team. Some factors to consider in designing a game room bar are adequate wiring and convenience outlets for electrical items, heating and cooling systems, lighting, acoustics and a good flooring material like carpet or hardwood. If considering to incorporate a surround sound TV with your game room bar, avoid smooth and reflective surfaces, but instead go with a carpet flooring because they work well with sound proofing. Overall, game room bars are a great place for bonding with friends and family. 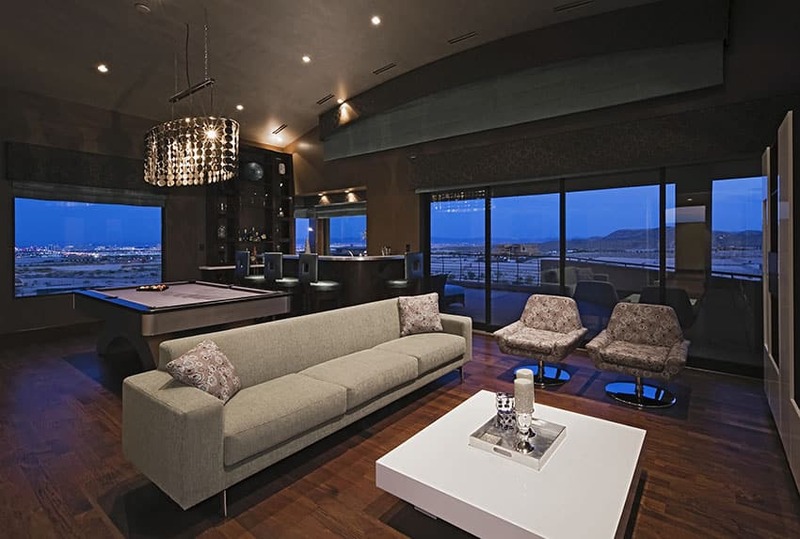 This luxurious modern bar and game room features wrap around windows for a stunning view of the outdoors and nearby city. The modern bar is equipped with a stainless steel countertop and matching silver bar stools. The lounge is a comfortable spot to retreat with cocktails and relax on the cream color couch or retro chairs. 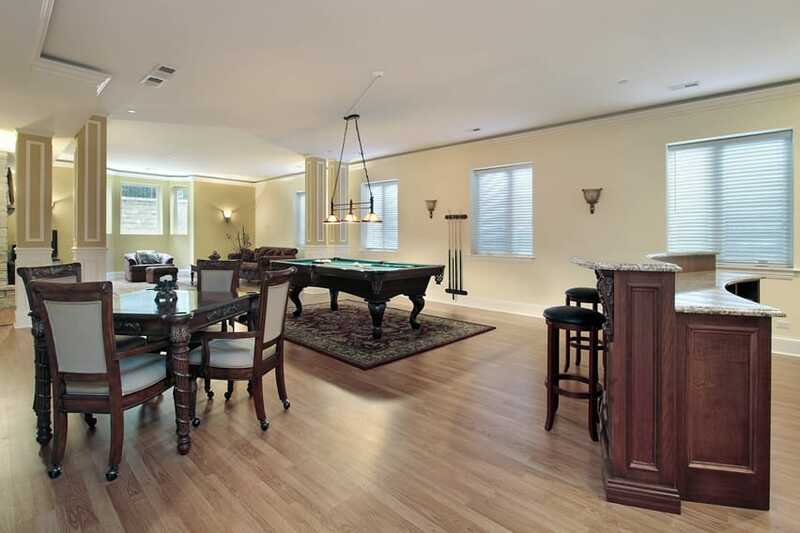 Rich wood flooring runs throughout the space and a pool table provides more opportunity for fun. Many home bar ideas come from the need to create an entertainment room and make it the perfect place to relax and entertain your guests. With a large space, this room is able to fit in a curved wooden bar which uses walnut cabinets. 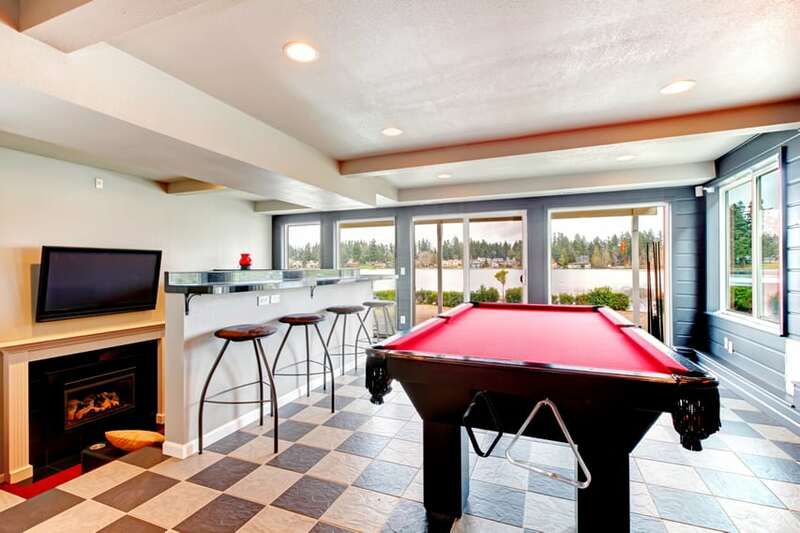 Aside from the bar it also has 1 living area, a pool table and a small dining/snack area. This game room is not complete without this small bar counter. Matching the modern look of the space, the bar area takes up minimal space, with only a built-up wall with a black polished granite countertop and 4 bar stools. It’s literally just a bar sitting area where you can drink or eat, but there is not actual bar adjacent to it. This game room bar is fully equipped with a corner bar with bar stools seating for three, a pool table, slot machines and craps table. 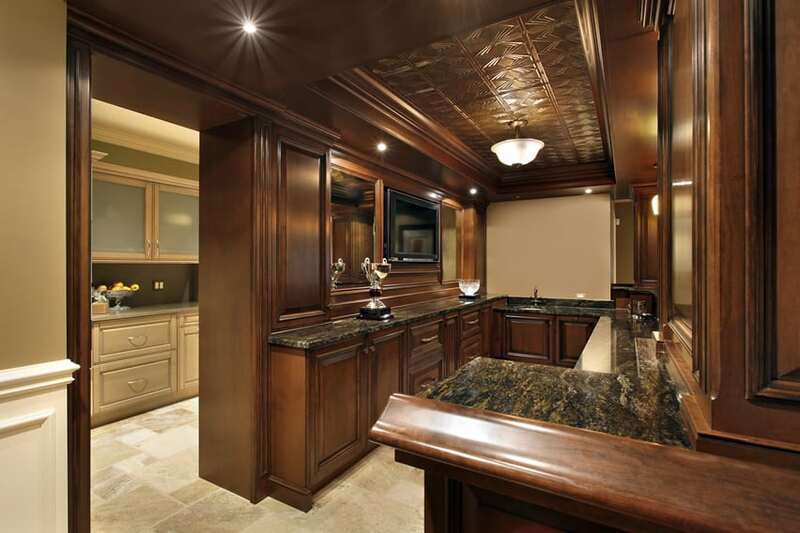 The dark coffered ceiling in dark mahogany creates an elegant and high end vibe. Decorated with colorful art prints along the walls, recessed lighting and natural window light, helps keep the ambiance of this room bright and fun. A basement bar is the ideal place for creating a room with your own personal style. 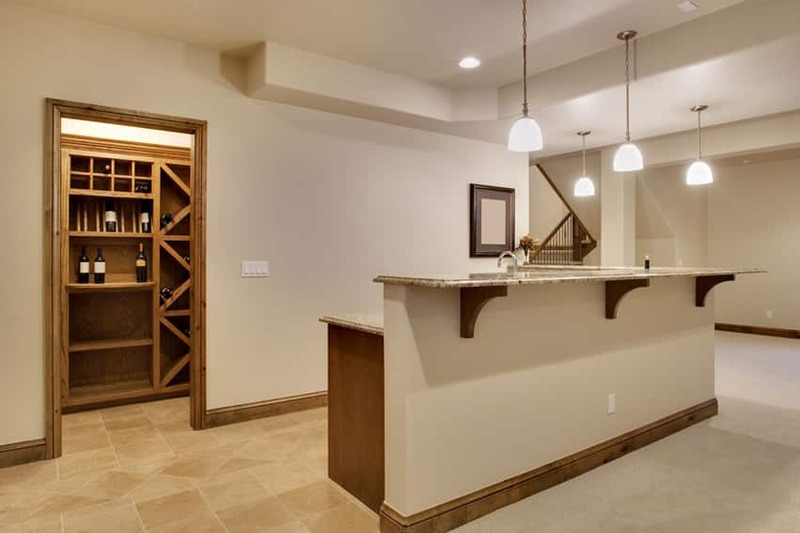 Since it is tucked away from high traffic areas within your home the basement can be the perfect canvas to create that rustic wine cellar you’ve always wanted, or create a modern bar and game room. 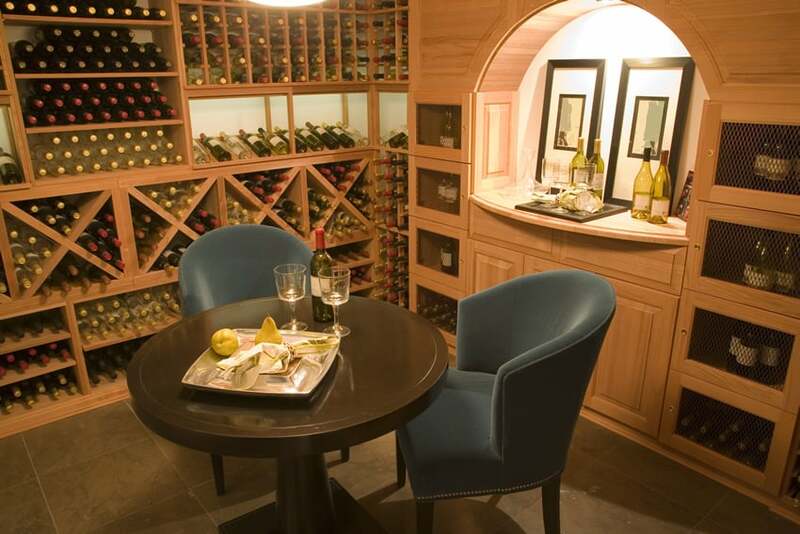 Another reason why basements are often converted into home bars is because of the spacious area that they offer. It offers great way to take advantage of an unused room in the home. Before turning your basement into a hangout spot, there are some preparations that need to be done. Firstly, consider finishing your basement. Evaluate the existing conditions such as the flooring, walls and the ceiling. Replace parts which need to replaced and repair those which are damaged. After that, you can now decide on what type of basement bar you want for your home. You can choose a simple wet or dry bar, but if you have the luxury of space, then transform it into a game room or a family friendly area with several entertainment options. 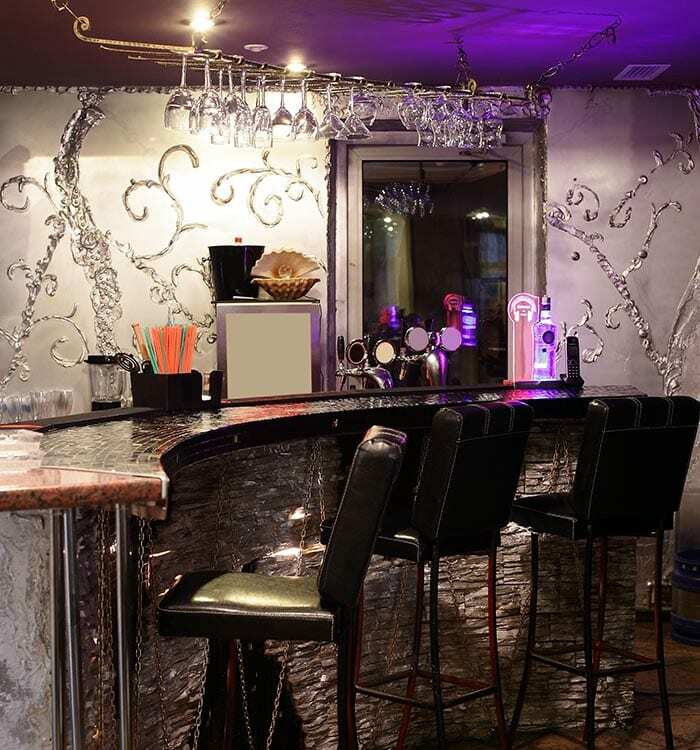 Basement bars can either have a formal or a casual theme. Formal basement bars showcase luxurious finishes like wood or natural stone, fine details like paneling and a subtle color scheme. 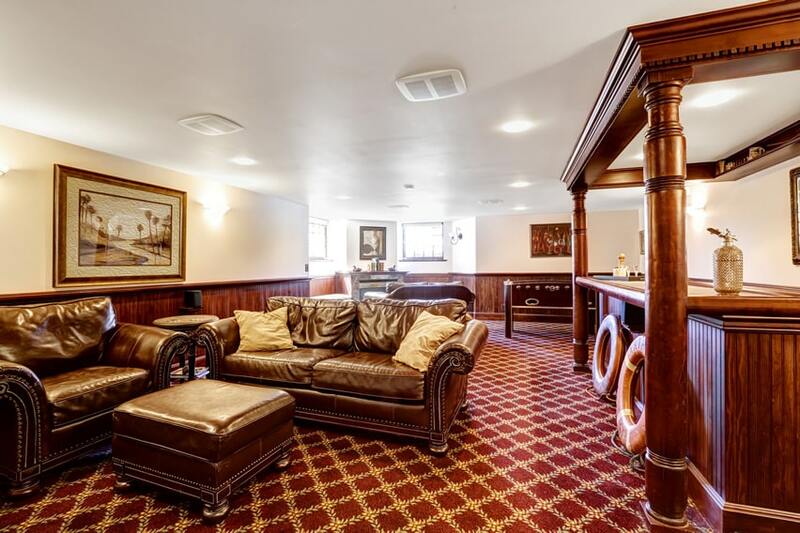 Casual basement bars have a more “laid back” ambiance and is less “stiff” or stately. You can also design your basement bar using a traditional style or modern style, depending on your preference. 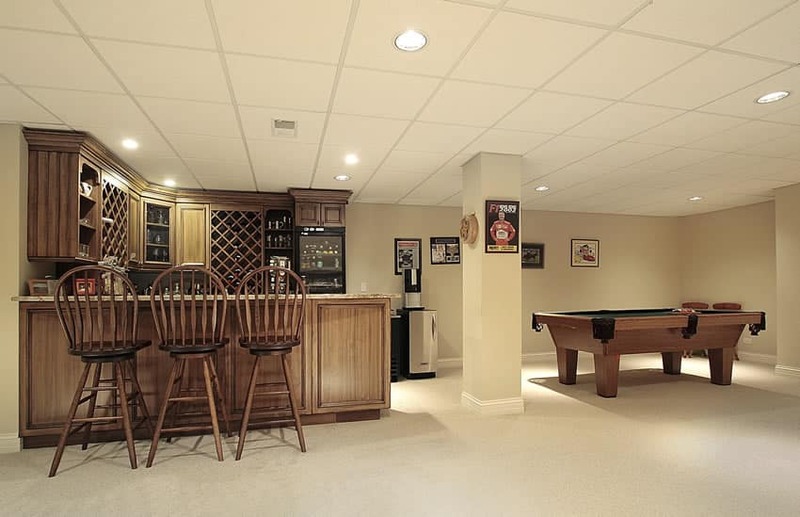 Other popular stereotypes for basement bars are sports themed home bars. Typically, basement bars with this motif display decorative items from sports. This is a source of enjoyment especially for those who are fans of particular sports teams. A simple basement bar area which doesn’t go overboard with fancy ornamentation. It features an L-shape counter in Oak wood finish with a higher counter made from built-up Ficem board and topped with the same granite material as the main counter. The wine and other drinks are kept inside the storage area with wooden shelves built in a variety of patterns. A harmonious combination of classic and modern, this basement home bar is a the perfect addition to any entertainment den. Placed beside a pool table in a space with plain off-white finishes, the gorgeous finish of the solid cabinets used in the bar area stands-out. A large wine fridge can be seen and 2 large wine racks are built-in on the overhead counters. It has three solid wood barstools with a backrest derived from the classic peacock chair. 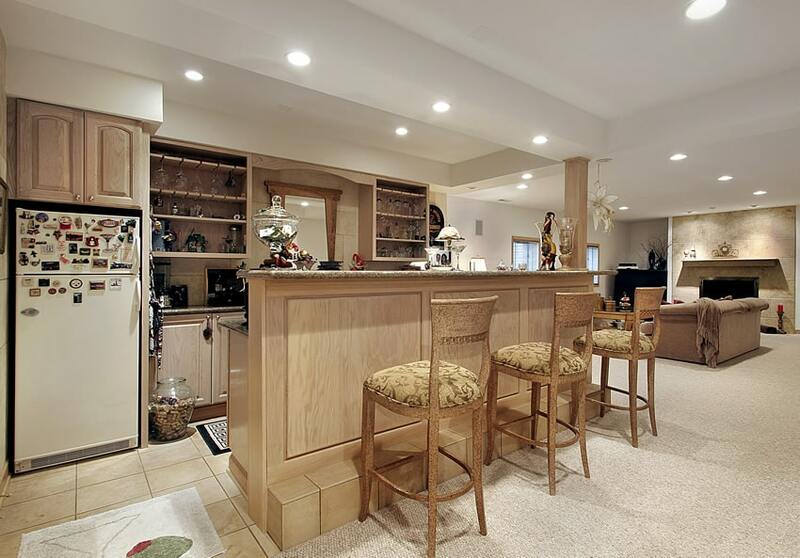 With a large floor space available, this home bar occupies a large space and is adjacent to the living area. 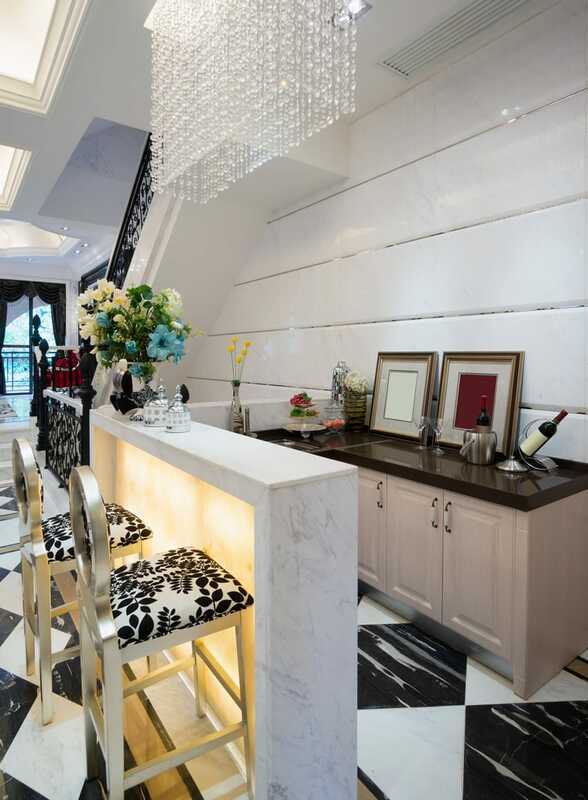 The snack/drinking counter is made from built-up gypsum with black granite top and behind it are wooden kitchen counters. with black granite countertop. It has one tall wine fridge and a Norman refrigerator built-in on the opposite ends of the back counter. This home bar is connected to the open kitchen of the house and also open to the other parts of the house. The wood-finish ceramic tiles on the floors and the natural stone tiles on the surface of the semi-circular bar adds a rustic & country appeal to the space. 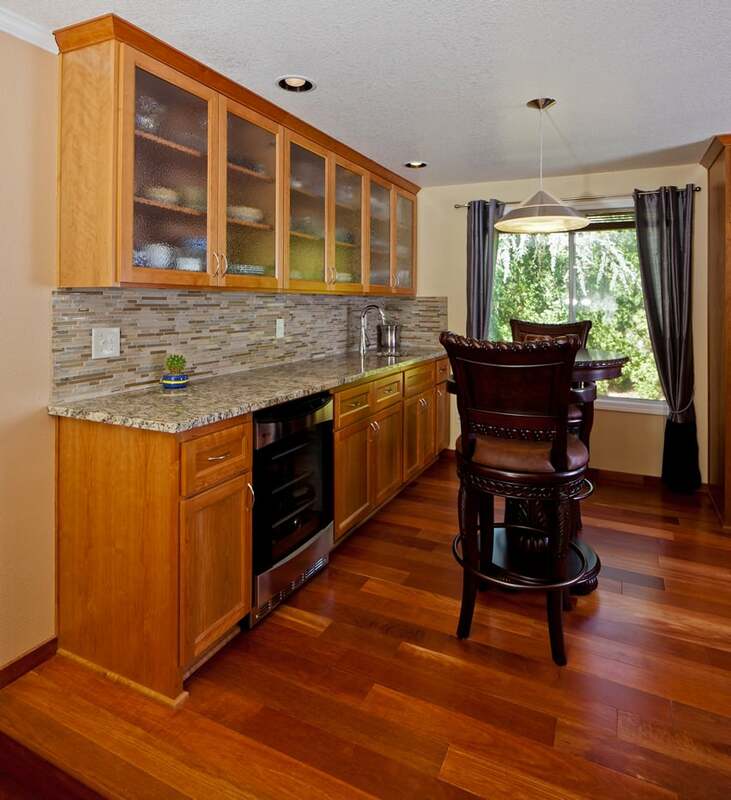 The counter area behind has mahogany-laminated cabinets and black granite countertop. 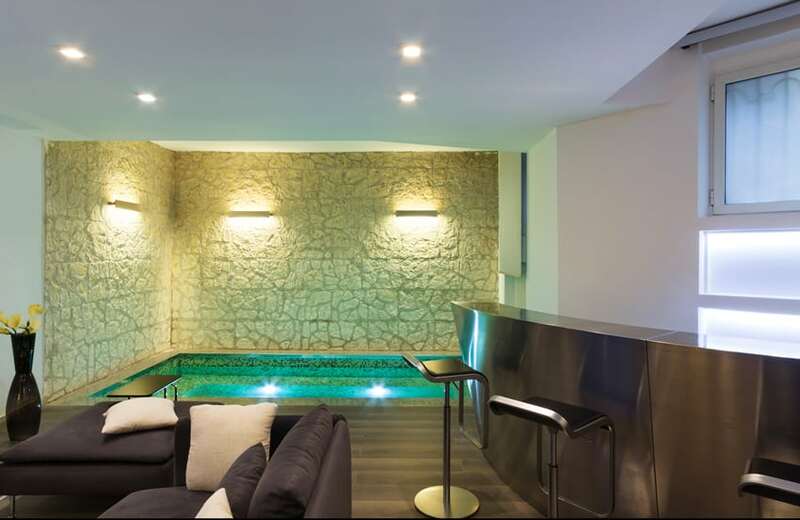 Equipped with an indoor pool/spa, this home takes it up a notch and also includes a mobile bar on the side. The bar has an eye-catching brushed stainless-steel finish in a circular form and has three modern bar stools to match. This nautical-inspired home bar takes the center stage in this home design with solid wood columns framing the bar area. The bar counter has vertical slats made of solid oak and topped with a thick slab of quartz stone. In front you will notice the two vintage life buoy rings as accessories. A unique mobile bar inside a game room made out of solid bamboo with varnish finish. The mobile bar is solely made out of a combination of split and solid bamboo and also has a matching pair of bamboo barstools, making a light and resilient mobile bar area which you can move around as you please. 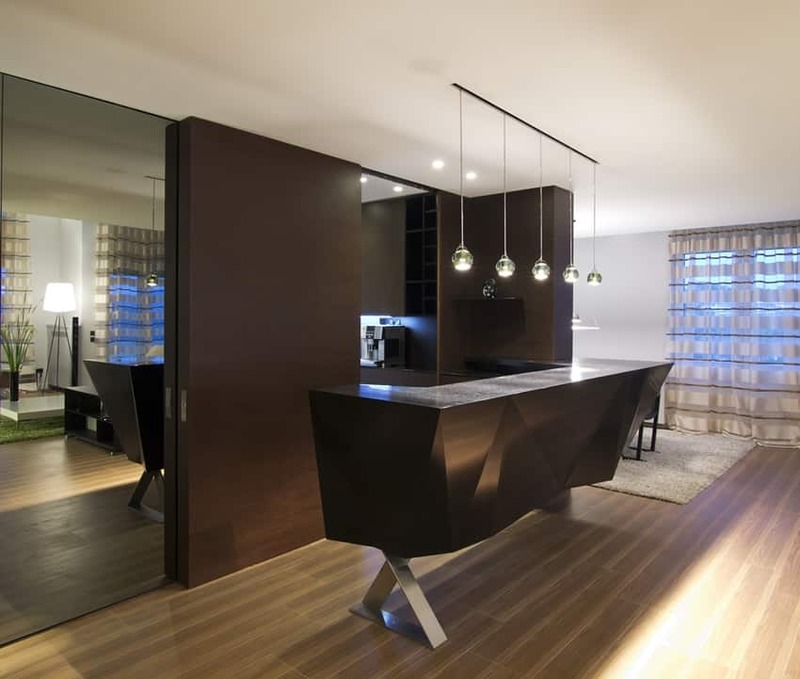 Another modern style home bar, this one is more adventurous with its choice of materials. While the counter at the back is kept simple using high-gloss white laminates, the main counter experiments with the use of backlit glass with patterns and textures. 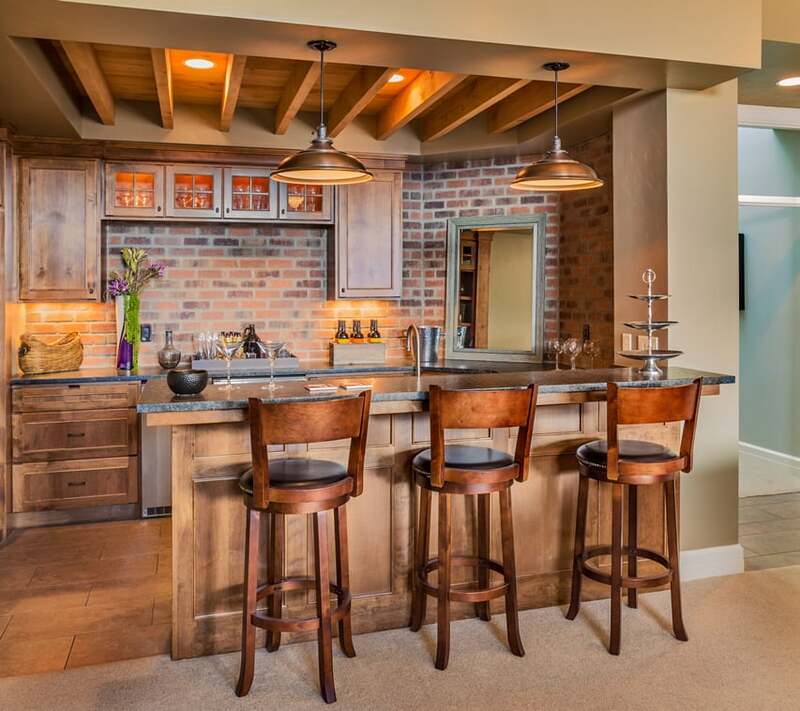 Connected to the living area, this home bar is in one of the most ideal locations, allowing you to serve your guests drinks while they sit down and relax. 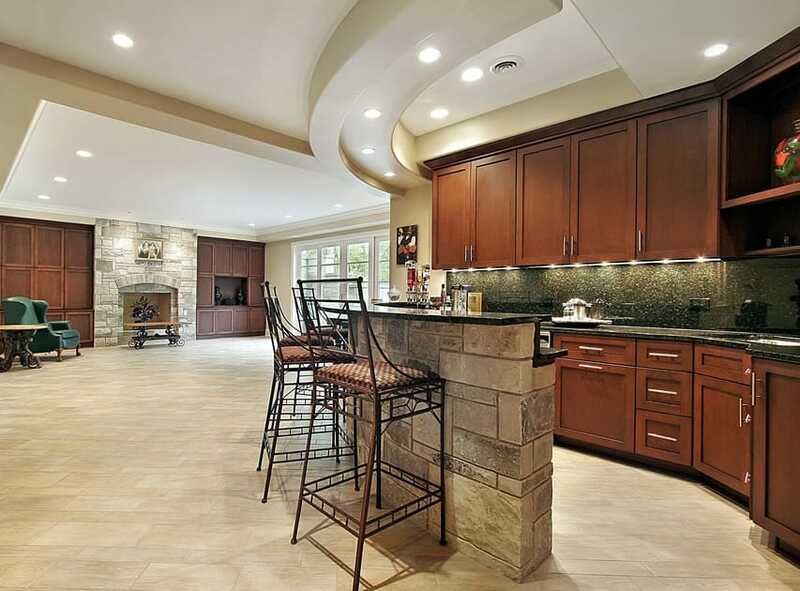 It has light beech laminated cabinets and beige granite countertops, and has shelves to display drinks and wine glasses. 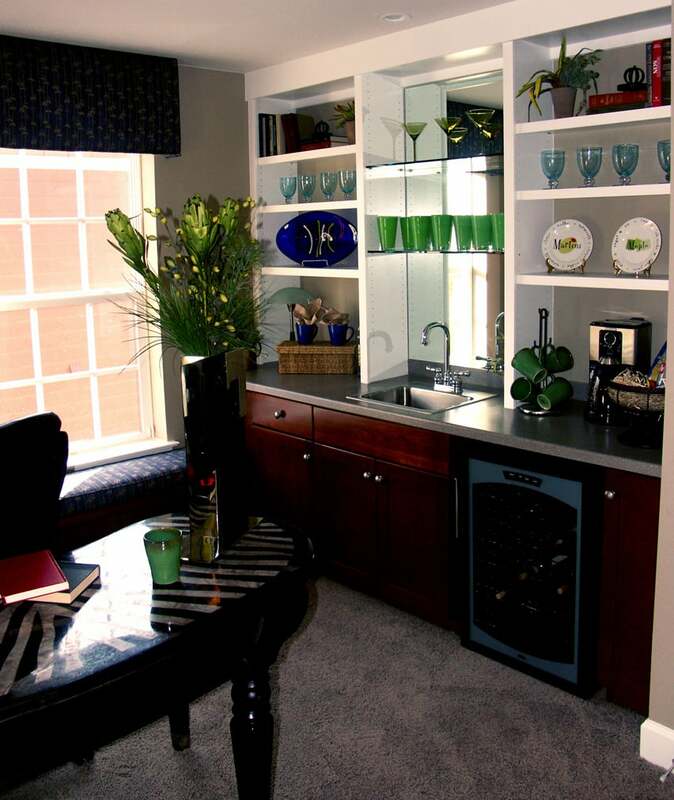 This small basement wet bar is tucked away in a recessed wall alcove. With open shelving, small countertop, sink and fridge, its well equipped for its compact size. This fancy home bar is a perfect addition to a bachelor’s pad or any home with a lot of space. The white modern bar counter is large enough to accommodate 9 people and it also has a display shelf at the back which uses the same dark wengue finish as the shelf dividing the bar from the lounge area. The crystals hanging from the ceiling also adds to the elegant and luxurious feel of the space. Determine the function of your home bar. Just like in any design project, the first and most significant step before planning is to know the purpose of the space. Determining the function of your home bar will help you decide on the layout, design and even the materials and finishes that you will be needing to complete the project. Before starting the draft, know how your bar will be used. Obviously, a home bar is utilized for entertaining friends, but aside from that, are there still any other activities that you plan to use your home bar for? Will it be used solely for preparing and serving drinks, or do you need it for preparing light snacks? How many users will there be? How much storage do you need? Are there any specific appliances that must be included in your layout? Do you want to use it for other activities, like casual dining, games and recreation? 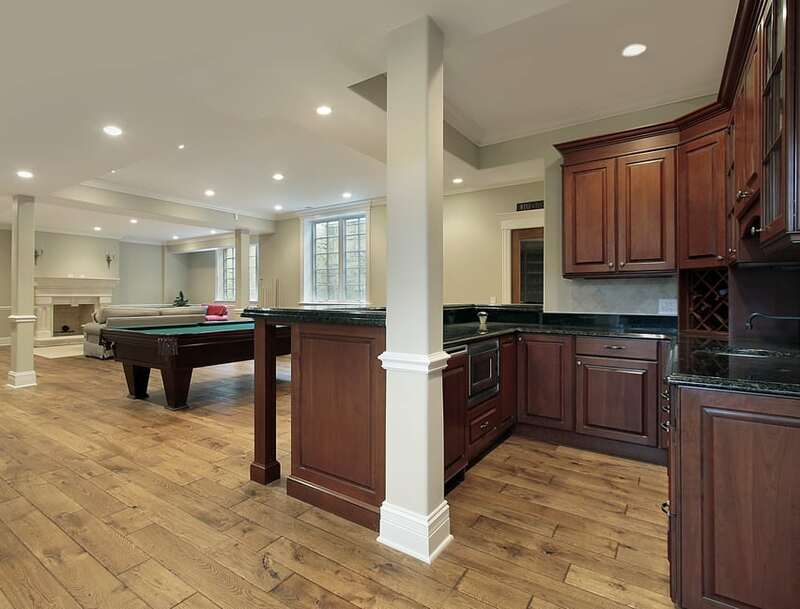 Do you want a wet bar or a game room bar? These questions can serve as guidelines so you can form a home bar design that is personalized and can cater to all of you needs. Although a home bar will seldom be used every day, it is still best to design it for everyday use. Pick an area in the house where you want to put your home bar. There are several locations where you can place a home bar. Typically, home bars are placed near the kitchen. 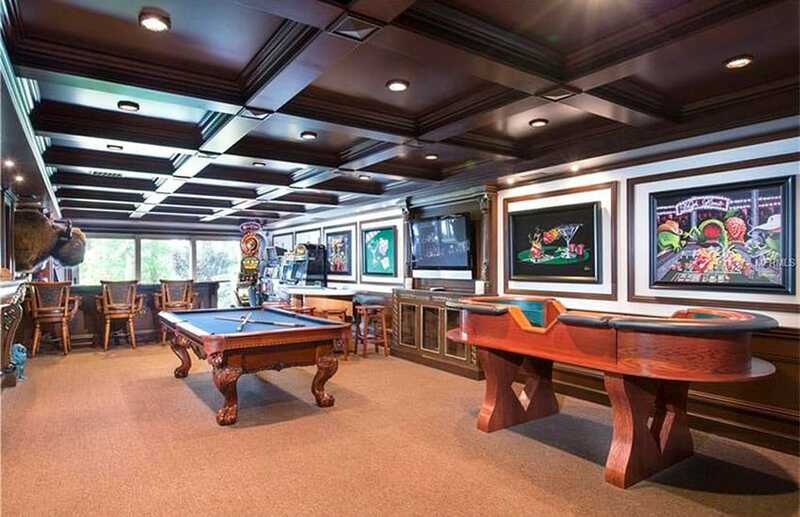 It can also be located in a recreation area, a game room, a den, a “man cave” or a garage. In some cases home bars are also placed between living rooms and kitchens, while acting as a divider for the space. 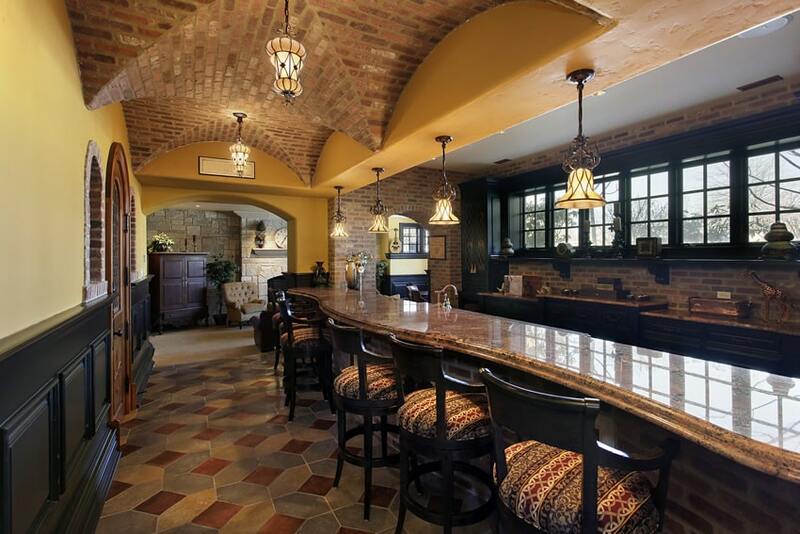 Some homeowners put their home bars in the basement, where it is away from all the traffic of the home. When home bars are placed in the basement, it can serve another function and may be incorporated with another area like a game room or a home theater room. If using the basement as the location of your home bar, make sure that it is free from leaks. Leaks and water can cause molds to build up around your bar. As mentioned earlier, one key tip to deciding on the location of your greenhouse is to keep it from excessive moisture. Pick a dry spot in your home. Moisture in the air does not only affect the materials that you use for your home bar but it can also affect the alcohol as well. Also, consider existing plumbing supply, electrical layouts and the availability of the space based n your specific home bar requirements. .
Plan ahead. This is in relation to choosing the location of your home bar. Before finalizing the location and the plan, know the existing site conditions of the location of your home bar. Figure out the existing water and electrical supply. These two factors are very critical because home bars essentially require a preparation area with a sink and it also requires a power source for wine chillers, refrigerators and other appliances. Also, take into account your budget. Your budget is also a significant factor in designing your home bar mainly because your whole project depends on it. It also allows you to narrow down your options for materials and finishes. It is also advisable to prepare a contingency fund in case of unforeseen works. Determine the size. Take accurate measurements of the space and conceptualize a layout that fits well and is proportional to the overall area. Make sure that the your home bar does not look to cramped up or overcrowded. Draft a plan and layout. Draft and layout a simple plan based on how you would like your home bar to look like. It doesn’t have to be a professional looking drawing, a simple sketch is enough, just as long as you have a guide which you can follow as you go about with your project. Also, collect design inspirations from magazines or the internet so you have an idea on the final look, the furniture pieces and the color palette you want to use. You can always hire a professional to help you with this phase. Designers can give you several furniture layouts and proposals in working drawing format which makes construction easier for a contractor since they have a detailed plan which they can follow. The shape of your home bar is also a part of the layout. Depending on the available space you have, it can either be a single line, a bar counter with a back bar, curved, round or even L shaped. A home bar also has different “zones”. Typically it is divided into a work and prep counter, the serving surface, the seating area and the storage. The work counter is the main counter where you prepare drinks and light snacks. The serving surface is usually the overhang i the work counter, or the raised ledge above your work counter and it is where your guests enjoy their drinks and casually dine. The seating area, on the other hand, is obviously, where the bar stools are set up. Usually, a home bar set up has at least two to four pieces of bar stools in the seating area. The storage can be divided into two types: the cold storage and the dry storage. Cold storage includes bar refrigerators and wine chillers. Dry storage are cabinets, shelves and drawers which are used to store glassware, utensils, bottled drinks, snacks, etc. Wine racks are also considered as a type of dry storage. Decide on the bar design. There are many types of home bar designs that one can explore. It can be a wet bar or a home bar which includes a sink in the layout. It can be a game bar, which also caters to recreational activities or it can be a portable bar, which can be moved easily and stored away quickly when not in use. Alternatively, you can also have a full bar if the available space permits. Full back bars have individual storage for bottles. The bar design will again, depend on the function of your home bar and the available space you have in the home. Choose a style for your home bar. Ideally, when conceptualizing your home bar’s final plan, choose a design which matches the prevailing style of your home. Your home bar must blend harmoniously and cohesively with all the other areas of the house. Materials and finishes will help you achieve the overall look you want and the texture and tone of your home bar. You can use wood for a classic feel, while if your house is modern, you can go with a more sleek and glossy surface. The color palette of your home bar must not deviate from the existing scheme of your home. If your house plays on neutrals, the stick with monochromatic tones so that your home bar does not look out of place. Standard widths, dimensions and heights are important in designing a home bar because it helps in achieving optimum functionality. When your home bar is planned according to such measurements, an ergonomically sound and anthropometrically correct design is achieved. • The minimum height of home bar counters is 42 inches. This height is based on the average height of most people and is comfortable enough for working, without having to bend over while use. • Minimum overhang to accommodate bar stools range from 10 to 12 inches. This allows people to sit comfortably without bumping into the front panel of the bar. For home bar counters which do not have stools or “standing only” home bars, the depth can be reduced to 6 to 9 inches. • The standard depth of a home bar counter is 24 inches. This is for the work counter or the bartender side of the bar, however this measurement can be adjusted depending on your preference. The countertop must be large enough to fit in a sink, if needed, but not too deep enough that you cannot reach it. 18 inch deep home bar counters are adequate if you only need the work surface for preparing drinks. Typically, this is extended to 20 to 24 inches to allow for more space for prep and for larger fixtures. Also, the work counter is usually 12 inches lower than the bar top. • Typical length of a home bar is 6 to 8 feet. The exact measurement will depend on the available space and the number of users. • The height of a foot rail for a home bar is 9 inches from the floor. • The standard countertop thickness for home bars is 2 inches. • Bar stools are usually 29 to 32 inches tall. Granite – Granite is not only the most popular kitchen countertop material but it is also the most used bar countertop material as well. It is a type of natural stone that is made up of quartz, feldspar and mica. This unique combination of minerals gives granite its distinct beauty and hardness. One of the main reasons why granite is a popular bar countertop material is because of its unique aesthetic appeal. Each type of granite possess different variations of flecks, speckles, veins and striations, while its color range from the most subtle hues to the richest tones. In general, granite gives home bars a luxurious and interesting appeal. It is most suitable if you want to project richness and elegance in your home bar. Aside from the aesthetics, granite is also considered to be the most durable natural stone surfaces. As they say, it is literally “as hard as a rock”. It is inherently heat resistant – coffee pots, hot pans, cigarettes and even trays from the oven won’t harm it. It is also scratch resistant and can stand up to everyday use. Although easy to maintain, granite bar countertops can sometimes can stain from spilled liquids, including alcohol. However, this can be avoided with preventive maintenance. Wipe any liquid immediately so they don’t seep into the stone’s surface. Granite is also sensitive to acidic substances, so make sure that your bar countertop is properly and regularly sealed before use. If you want a long lasting countertop for your home bar, then granite is the right choice for you. Provided that it is properly sealed maintained and cleaned well, granite bar countertops can last for decades which makes it a wise investment. On the average, a granite bar countertop can set you back $20 to $100 per square foot, depending on the type, color and pattern of the material. Quartz – Quartz is a type of engineered stone that is composed of a mixture of 93% crushed quartz and 7% epoxy based resins. The addition of epoxy based resins to crushed quartz holds and glues the particles together, reinforcing their strength and durability. To give color to this material, pigments are added to the mixture. Quartz comes in a wide range of colors and its design highly resembles the appearance of natural stones like marble and granite. Basically, quartz is stronger than natural stone, but is equally beautiful. 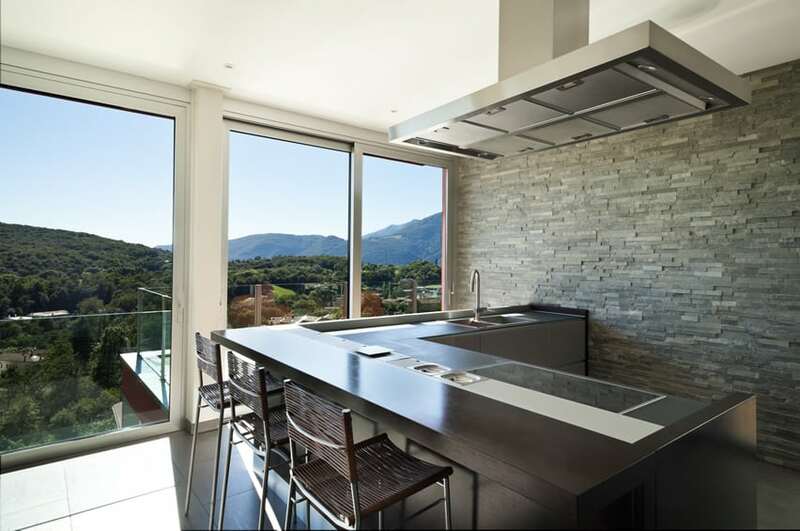 Compared to natural stone countertops, quartz needs less maintenance, is resistant to heat and does not get easily scratched. Unlike stone, it does not need to be sealed. Design and book matching is also easier, because quartz does not come in slabs with varying patterns. The transition of color and pattern is more likely to be even, since it is manmade and not natural. Since it is very stain resistant, quartz is highly suitable to be used as a bar countertop because it probably won’t get damaged from liquid spills and alcohol. Also, it has a very smooth and solid surface which makes prep work easy. When it comes to the cost, quartz is more expensive than granite, with an average of $70 to $90 per square foot, depending on the brand. A basic quartz counter typically cost $60 per square foot, while high grade quartz cost up to $100 per square foot. Solid Wood – If you want a classic look for your home bar, then a wooden countertop is the perfect choice for you. Traditional bars are usually made up with wood, specifically mahogany and they are proven to last for years. The best thing about wood is that it is highly customizable and can be shaped into any form, size and style. It can either be finished with paint, stains or even left to its natural state (but sealed) which makes it suited for any design style. In addition to that, the natural beauty of wood cannot be matched by any other material. It contributes a sense of coziness which makes spaces more warm, relaxing and inviting. When using wood for your home bar countertop make sure to apply a sealer on top because it is vulnerable to water and liquid damage. Also, avoid incorporating a sink into your home bar countertop if using wood because compared to other materials wood is still softer. Wood is naturally prone to molds, mildew and rot when exposed to moisture. It also has the tendency to warp, expand or get scratched, so make sure that all these problems are addressed before use. On the average, solid wood bar countertop cost $30 to $60 per square foot. Wooden bar countertops can get quite expensive if custom made and filled with special millwork and finishing. However, if you have the talent and can engage on a “do yourself project”, then the costs can significantly reduce, making it fairly affordable. Overall, solid wood is a good choice for bar countertops, especially when it is finished in a thickness of 1 ½ inches. Some popular wood species which are used for bar countertops are cherry, teak, walnut and oak. Stainless Steel – Stainless steel is more commonly found in modern and industrial themed home bars. This type of bar countertop material is heat and scratch resistant. Stainless steel is also cool to the touch and is very smooth and solid, which makes it an ideal preparation and working area. And since home bars are lightly used, stainless steel bar countertops are known to last forever, provided that it is properly installed and maintained. The main reason as to why it works well as a bar countertop is because it impossible to stain. So seeping liquids are the least of your worries. However, water spots and fingerprints can leave marks on this type of surface, so it may require frequent wiping for it to look consistently good. If alcohol or any other type of beverage disperses over a stainless steel bar counter, it can be easily cleaned using a piece of cloth. Cost wise, stainless steel is very expensive and costs about $100 to $200 per square foot on the average. Tiles – Tiles are another traditional countertop material for home bars. It may either be porcelain or ceramic. Tiles are easy to clean, durable and comes in a variety of designs, colors and patterns. Like laminates, tiles are inexpensive, costing as little as $10 per square foot, depending on the size, type and design. Although tiles can be used as a countertop surface for home bars, they come with a disadvantage and are probably one of the least advisable material that you can use, primarily because of the grout lines. The main problem with tiles stems from the grout, as spills, dirt and other grime may seep into these seams and may be quite hard to clean. Tile surfaces may be easy to clean, but the grout lines require added upkeep. Also, tile is an uneven surface, so it is not recommended for sliding around cocktail glasses. Designer’s Tip: Although Marble is one countertop material you can explore, when it comes to bar countertops, they are not recommendable. They are luxurious, rich and sophisticated, and smooth to the touch too, but generally lacking when it comes to resistance to liquids. Since the home bar is regularly exposed to water, alcohol and other liquids, it is important that the countertop material is non porous. Marble is highly porous and can stain easily with spilled alcohol. Among the natural stone countertops, it is the most fragile. Compared to granite, it is more prone to cracking and chipping. Laminates – Laminates are a type of material that is usually used as a surface covering for wood. Popularly known as Formica, laminates are made up of several layers of materials that are sandwiched together. Laminates are produced in thin sheets but they do not lack resilience and toughness because of their material composition. The top layer of laminates are made up of a protective layer of melamine resin. Beneath the top layer, is a decorative layer which contains the pattern, design, texture and color of the laminate. Its core layer is made up of Kraft paper that is reinforced with resins, while its wear layer is made up of a combination of paper, aluminum oxide and melamine resin. Laminate is usually glued on top of a sturdy material to improve its quality and aesthetics. It is commonly applied to a strong plywood or a wooden substrate. 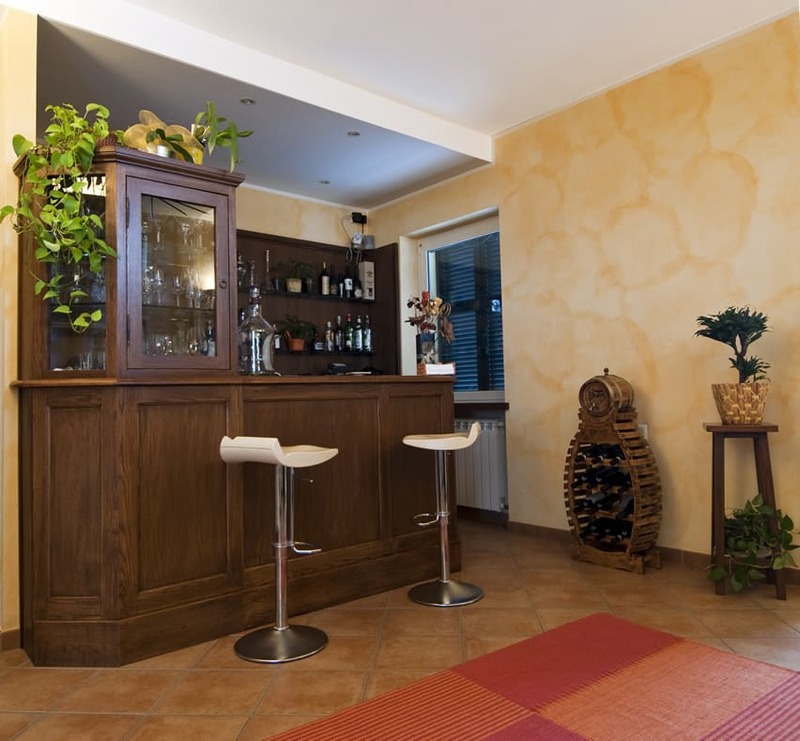 Laminated countertops are wise choice for home bars because of their durability. It can withstand the wear and tear of use, and along with proper care and installation, laminated countertops can last for 20 to 30 years. It is also inexpensive, costing around $5 to $25 per square foot. Aside from the practical benefits, laminates are also versatile. 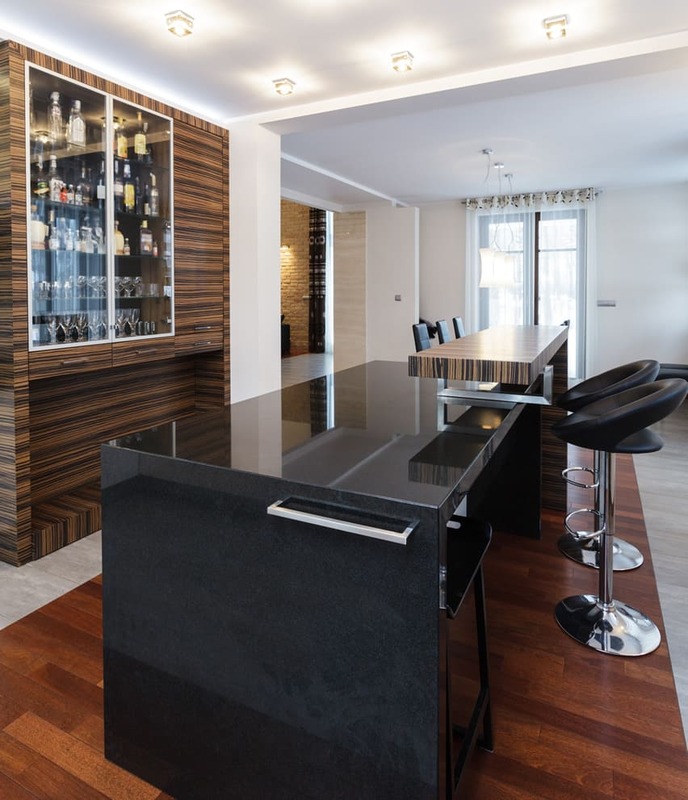 When it comes to design, laminated countertops offer a wide range of choices that can suit any home bar design style , whether it may be traditional, Mediterranean, rustic, contemporary or modern. It is available in a broad spectrum of colors, designs and textures. Some laminates also mimic the appearance of natural materials like wood and stone, so it can be used as an alternative if you want to cut on costs but achieve the same design aesthetic. The edges of a laminated bar counter can also be finished with bevels, curves depending on one’s personal preference. Although practical to be used as a home bar countertop, laminated countertops also have several drawbacks. They are sensitive to excessive exposure to water. Spilled liquids like alcohol can get in the seams and produce potential damage, however, this can be prevented if such spills are wiped at once. If using laminates for bar countertops, it is more recommendable to be used in the prep counters or the working area. Solid Surfaces – Also known as Corian, solid surfaces are one of the modern alternatives for traditional bar and kitchen counter materials. It is an artificial material that is homogeneous all throughout, meaning the top, middle, bottom and surface are all the same. Solid surfaces are built to look like stone but have added benefits when used. The primary reason as to why solid surfaces make good countertops for home bars is because this material is non porous. Unlike stone, solid surfaces do not absorb liquids, thus they are not prone to bacteria build up, molds and mildew. Solid surface countertops are also very durable and can last for years. They are easy to clean, requiring only minimal wiping using a cloth or paper towel with cleanser, and are resistant to stains from liquids and other substances. Another advantage is that they have a smooth surface, which is ideal for setting up glassware and serving drinks. One downside of solid surface countertops is that they are not scratch resistant, however these surface scratches can be repaired easily with a little sanding and buffing. Also, if your home bar design uses an overhang for tucking in bar stools and for knee space, this might not be a good choice. This is mainly because solid surfaces have the tendency to crack under heavy weight, so if your home bar countertop has an overhang, make sure that your solid surface countertop is cantilevered with an additional support. Design wise, solid surfaces are available in a wide array of colors, which makes mixing and matching not a problem. It can be matched with both traditional and modern home bar designs, and they contribute a rich and luxurious feel to a space. Compared to other bar countertop materials, solid surfaces are quite expensive. Typically, they cost $50 to $120 per square foot, depending on the design, color and manufacturer or brand. Also, this type of material requires the services of a professional when it comes to installation. 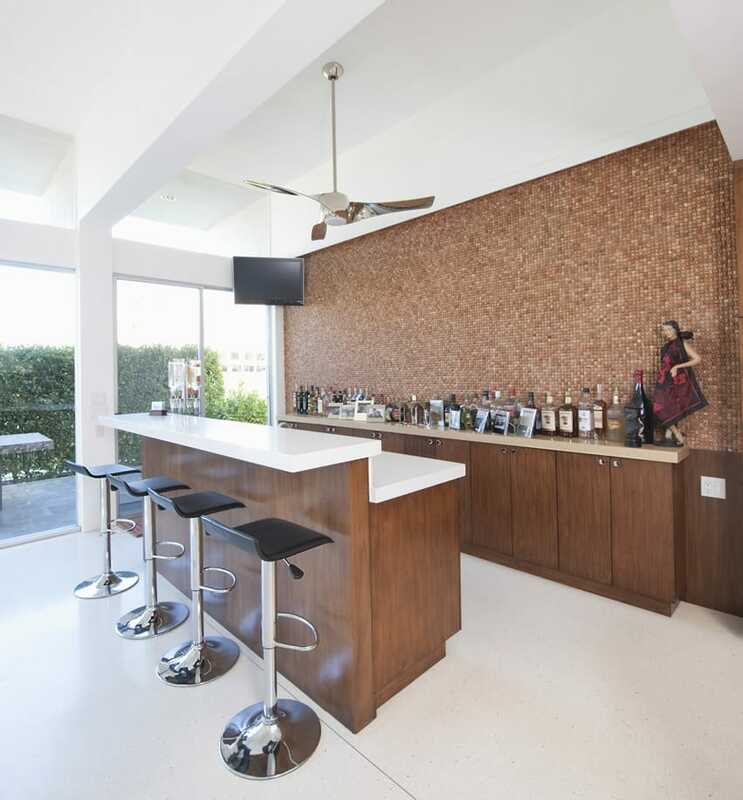 Concrete – Concrete countertops are more prevalent in modern home bar designs. It is made up of a mixture of cement, gravel, sand aggregates and water. Concrete counters resemble the look of natural stone and are often in precast molded forms. Precast concrete counters are delivered to the site fully cured and finished and just require installation. The typical thickness of concrete bar counters are 1 ½ inches and can be fabricated to any length. Concrete is porous but once honed and sealed, it becomes stain and water resistant. It is highly durable because it is often reinforced with a wire mesh, metal rebar or fiberglass fibers to add strength. In addition to that, concrete is also flexible, can be molded into different sizes and shapes and may be stained into different colors by adding pigments during mixing. Concrete bar countertops cost $85 to $100 per square foot and has a lifespan of 50 years. Epoxy and Resin – If you want to go with something decorative and unique for your bar countertop, you can try exploring epoxy and resin. Epoxy and resin is a clear, thick substance that is poured over another material. When it hardens, the end product is a smooth, hard and solid surface that is durable. The main difference that it has with natural stone counters is that whatever material is underneath the resin can be seen clearly and it more importantly, it is less porous. So basically, this material is used if you want to transform a unique material into a workable solid surface – like coins, trading card, pictures, etc. Epoxy and resin can also be poured on top of mosaic tiles or even ceramic tiles, if you want to eliminate those problematic grout lines which catch dirt. This type of bar countertop works well for home bars which follow a theme. For sports themed home bars, you can use trading cards or other memorabilia sandwiched in resin. If you want to showcase a collection, like corks from wine bottles or stamps, this is a good way to display it in home bar while preserving it at the same time. Epoxy and resin bar countertops are chemical resistant and heavy duty. It is also stain and bacteria resistant, easy to clean and has a minimum lifespan of 10 years. This modern bar area is not strictly a bar for drinks and cocktails. It also serves as a small show kitchen wherein you can cook while you entertain the guests. Following the modern theme of the interiors, the kitchen bar area uses laminated counters and cabinets, as well as built-in induction cooker and a sink. The accent wall is finished with slates tiles to add a little more texture and personality to the space. With a gorgeous view, you would surely have a good time unwinding in this home, especially with a mini bar to make yourself a martini while watching the sunset. This luxury living room space has a light modern tropical feel, with light beech wood floors and white walls. The bar counter follows the same theme with its white counter and light beige countertop plus a matching bar stool with beige leather upholstery. 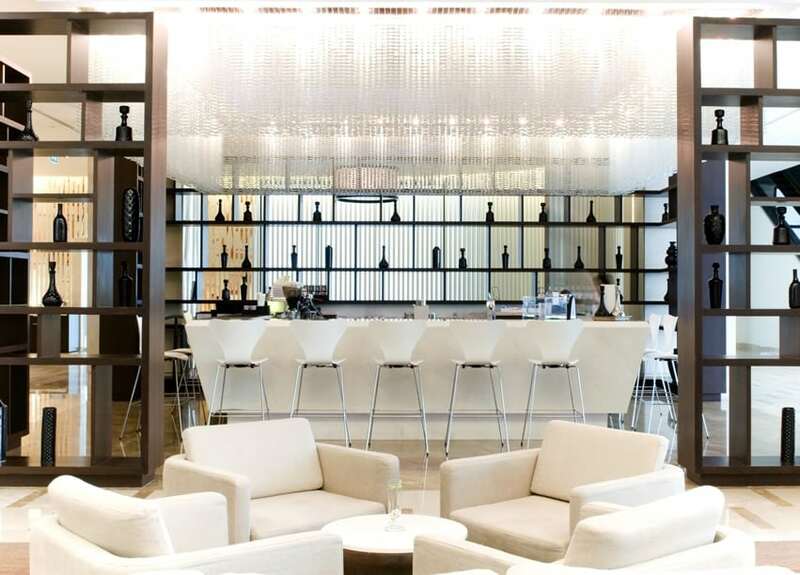 A luxurious modern bar area which looks like a reception counter of a modern hotel. The black quartz bar counter is free-standing as opposed to the more common built-in counters and has x-legs in stainless steel. The bar’s form has a gorgeous geometric design and is paired with 5 glass pendant lamps and mirrored back walls, creating a sleek modern look. Featuring a unique modern design, this home bar is sure to be a hit. It has a floor-to-ceiling display shelf/cabinet for the wine and other beverages and has an island bar counter with a lower counter using black granite and a higher and narrower counter laminated with the same zebra wood laminate as the display shelf. This home bar is large enough for a full-size kitchen, featuring cabinets made from solid oak and ceiling paneling using the same oak wood finish. It has gorgeous dark granite countertop and also integrates built-in appliances into the cabinet design. Visit this gallery page for additional small man cave ideas.